Erm...everything's happening at once. The FTSE is, as I write, down 2.1% and below 5,000; there's been a "flight to quality" in the bond markets - people clamouring to buy US debt and getting out of anything risky. So why? It's a combination of what didn't happen and what might happen. What didn't happen at the weekend was that the G20 didn't come up with any unified global stance on combating a double-dip recession. It said in effect: if your political and fiscal situation demands austerity, go ahead; meanwhile if you can get away with more fiscal stimulus, be our guest. Now, on top of that, the European Central Bank is preparing to pull 442 euros worth of liquidity out of the EU's banking sector. The ECB had extended the biggest ever central bank equivalent of a cash float to the stricken banks on a 12 month basis: from Thursday it will withdraw that facility. And Spain's banks above all are raging about it. Meanwhile the Greek sovereign debt crisis won't go away. Despite being thrown a lifeline by the EU on 9 May, the quality of Greek debt keeps getting re-assessed downwards, increasing the likelihood - doom doctor Nouriel Roubini thinks near certainty - that it will default. If it defaults the whole EU 700bn flood defence will get tested for the first time. Then on top of that there are worries that China has peaked: that its stimulus is running out of steam. The Shanghai stock market is 4.25% down on the day, 28% down on the year. Commodity prices are falling on the assumption that Chinese demand will dip once more. Finally there are the banks, and above all the European banks. The Bank for International Settlements warned yesterday that there is just a huge amount of unstabilised bad debt out there. the deep recession brought on by the earlier crisis. rates are already at zero and central bank balance sheets are bloated. The remedy according to the Basel banking bigwigs is: rapid fiscal austerity, keep the economy moving with monetary policy, rapid reform of global banking. However, that takes us back to where we started: the G20 showed no signs of urgency about global banking reform; passed a take-it-or-leave it communiqué about fiscal austerity vs growth and - with the ECB at any rate - monetary policy is being shifted towards removing liquidity. Basically the world - and above all the Iberian peninsular, notwithstanding today's crunch game - has more to worry about than football. Germany 4 - England 1. Why were England so poor? It all goes back to the basic truth of modern tournament football: the well-coached sides win things. Now everybody can defend you have to be able to defend, break, find space but above all - in a tournament - adapt to new conditions like a team. You have to be a learning organism. This is what Capello tried to teach England: to play like a squad, adapt like a squad. But all that happened was that some of the players attempted a rebellion against his system. That is no surprise because it is exactly what happened with France as well. Italy too went home because they could not or would not play the system the manager wanted to play. Having tried and failed to impose their own system on Capello, the players then lost morale, self-belief and skill. In the case of England and France this dissent and player power reflects the huge problem of trying to make millionaire club stars play to a system they don't like. In the case of Italy, the "terror in the legs" phenomenon was probably the result of a similar issue. It's not a problem in club football because players get bought by managers with an exact idea of their skills and on-pitch role, so they rarely have to involuntarily adapt. Maybe in this World Cup we've seen the first real triumph of the economics of modern football over skill and organisation: the triumph of a club-first, nation-last mentality and individualism over teamwork. Capello did his best to kill the player power culture that was evident last time: the self-selecting team, the WAGs, etc. But it simply resurfaced in the form of failing motivation and failing skill. This in turn reflects England's weak domestic skills base that's resulted from the unrestricted use of foreign money and foreign players. If you look at the teams that had very little talent but were well coached eventually they too fell apart against teams that had both: Ghana beat the USA for this reason, and for the same reason the next three games are a cert. Argentina, Holland and Brazil should go through. So Capello was not wrong to try to impart system and team discipline to England. Even if he chose the wrong system (4-4-2) we will never know, because England never won themselves the breathing space to try 4-4-1-1 in a competitive game. The whole English FA now looks very exposed as a result of this poor showing. They failed miserably to keep control of Sven or the players in 2006. Their remedy was to appoint a disciplinarian who could at least control the players and who seemed to get the best out of them until they faced world class opposition. But if you look at what's wrong with English football it starts with the junior game, where there's a horrendously physical and low-skill philosophy preached; then, for some reason, all the clever people get weeded out by the club system so that the words "intelligent, inventive England player" are impossible to write; finally the money pouring into the English premiership in the form of leveraged club buyouts allows club managers to buy their way out of having to train and develop English talent and we only find out once every four years what is wrong. England's outstanding badness in World Cup 2010 must be a symptom of something bigger: the fact that we've got the most expensive, highest leveraged club system - and that none of our players play outside it - must have contributed to the weakening of commitment to the national colours, the evisceration of upcoming talent, the creation of an unmanageable team of frightened individuals, each of whom will now be dictating a valedictory ghost-written column to their chosen tabloid newspaper before getting on with life as a millionaire. Like failed bankers they will pay no penalty for failure other than public opprobium and, as everybody in high finance knows, you can live with that as long as you own a Lamborghini. Basically, we've just seen the Lehman Brothers of football and it was not pretty. The June 2010 budget was unusual because it had a clear narrative: it said our aim is X and therefore we are doing A, B C. Previous budgets have not always been so clear. -	That they will aggressively eradicate the structural deficit, piling 32bn of cuts and 8bn of tax rises on top of the 73bn planned by Alistair Darling. -	That they will avoid tanking the economy by encouraging a rapid switch from public-sector led growth to private sector, investment and export-led growth. -	That they will avoid piling the pain onto the poorest. -	The scale of the cuts required, lumped onto departmental spending, means there is no guarantee they can be achieved. If you flick through the data on UK public spending, not even in the years of Denis Healey and Geoffrey Howe did departmental spending fall. It may have been eroded by 15% inflation - but it always rose in nominal terms. We have no culture and no experience of slash and burn in living memory. -	There is no guarantee that the UK can make this switch. If you look at the table "Gross Domestic Product and its Components" in this OBR document, released yesterday, you will find some pretty heroic assumptions. Exports rise 90bn, fixed investment rises 60bn, and the trade deficit falls from 44bn to just 9bn - all over a period of five years. GDP grows by around 150bn over that period, while government consumption actually falls by 30bn. -	Finally it is not clear how hard the poor will be hit until the service cuts take place. The graph the government produced to show the Emergency Budget was "progressive" does not show precisely that. It shows the top 10% of earners (over 50k) lose about 2% of their income - but mainly because of income tax changes introduced by Labour. 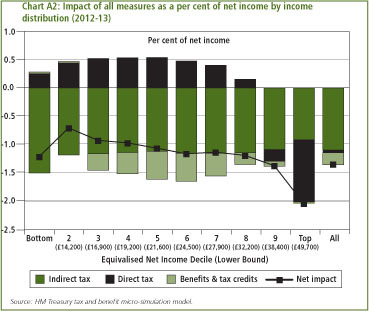 For the bottom 10%, unable to gain from tax changes, the VAT hike dents their real income by about 1%. The curve looks less like a ski jump and more like a banana: it is much flatter than the income tax curve - where the richest lose 50% of their income and the poorest (under 7.5k) none. These are not minor problems. The gap between intent and effective action is large when it comes to transformations of this kind. We are used to politicians being able to take effective action: on banking they eventually muddled through and cauterised the crisis. But not all problems are solvable through technocratic means and strong narratives. We've banned dangerous dogs apparently, but my local park is teeming with them and their be-hoodied owners. We've been nearly ten years trying to solve Afghanistan. Or, to use a more precise parallel - we've tried and failed to build and NHS-wide IT system. When I reported on the launch of the NHS IT project the veteran investigative reporter Tony Collins told me. "If somebody walked into the Treasury and said 'let's build a bridge from Britain to America' they would be laughed out of the building. But if you walk in and say lets computerise the whole NHS onto one system they simply ask: 'when can you start?'." And it came to pass that building the NHS IT system turned into a major and intractable disaster wasting billions as predicted by Mr Collins and his ilk, who had seen it all before. We are seeing another example of the limits of technocracy and engineering skill played out in the Gulf of Mexico. What George Osborne did yesterday has for now sealed Britain off from the risk of a sovereign debt crisis. But the other risks are pretty clear. The fiscal tightening creates a hole in demand the size of 6.8% of GDP by 2014. Yet the OBR predicts growth of 2.7% by then. To travel at 2.7 km per hour into a headwind of 6.8 km per hour you are really motoring at a notional 9.5 kmh. In other words, we are expecting a growth effect from this budget that takes us into the same league as Brazil or China. That is a big ask. But it doesn't just rely on investment flowing into UK manufacturing and services. It needs the market for these goods and services to be expanded. Mr Osborne was not wrong to appeal to the G20, which has urged trade surplus countries to start consuming so that those with budget deficits can produce and export their way out of crisis. But this again is easier said than done. The whole story of the decline of UK industry during the Labour years was of expensively attracted investment - the LG factory in Scotland's Silicon Glen springs to mind - that failed because the market and the price was never right. And so far, the fall of sterling has only partially stimulated exports: companies have been content to take profits rather than expand production. If the economic risk is of a double dip recession, further undermining sterling and the FTSE without any real uptick in export performance - the political risk is also obvious. The crunch day will be 22 October, when Departments finally find out how much they are to lose. At this point the Liberal Democrats will have to face down councillors and party activists. The current shape of the trade-off has been that the Libdems abandon key principles expressed before the election (2.5:1 ratio of cuts to tax, opposition to VAT etc) in return for serious constitutional reform and the Great Repeal Bill. Once schools, universities, libraries, day centres and the like start closing, and tens of thousands of public servants get their P45s - that deal will be weighed in the balance again. George Osborne is delivering his first budget. Here's an open thread for Idle Scrawlers. Will blog substantively later. UPDATE, SUNDAY: Rooney has apologised. If you want to read something even more insightful than this post, skip straight to the comments. Some very wise stuff, commenteers. Thanks. What follows was written straight after the game on Saturday night. OK so you are Capello. What do you do? It's not enough to fantasise about sacking him in mid-tournament since fundamentally England's draw vs Algeria was a problem of performance. Ranting aside, it's important for managers - in both business and sport - to work out what is actually wrong; not what they hope is wrong. What is wrong with England is, as always, self-belief. Algeria watched the film Battle of Algiers to psych themselves up for the match (hat-tip to Richard Williams of the Guardian): England, by contrast, made individual celebrity guest appearances on the James Corden show. Even if there is no skill, no energy, no gameplan, sometimes you have to reach deep into national mythology and pull some effort of the will from somewhere. I wonder whether these England players have any cultural connection left at all to the England myth which abides in the pub in the shadow of Sheffield Forgemasters, in the white vans queueing impatiently at traffic lights today; the little family gatherings around the M&S finger food and plasma TV screens. Beyond self-belief there is another problem. Fitness. Is it me? Am I becoming unhealthily fixated here? Or do most successful teams consist of people who have waists rather than muscled torsos the shape of a door? Beyond poor bone fitness and cartilege fitness England seem to be carrying, collectively, a shedload of bodyfat. Most performance coaches will tell you that shedding weight can make a crucial difference. Lesson: get off the golf course and train. (I exempt myself as a professional journalist of course). Third. Get the formation right. If you are going to stick to 4-4-2 you have to possess the ball in midfield. England never did - constantly losing it there, and even in the channels from defence to midfield. If you are going to go 4-3-3, or 4-4-1-1, get Joe Cole on and have done with it. Fourth. Never slag off the fans. All that money that flows so effortlessly into your accounts, guys, comes from the Ordinary Joe paying 30, 40, 50 quid a month for a Sky box; or from advertisers whose beer the Ordinary Joe drinks, or any number of betting websites where the said Joe loses his money. Fans should be allowed to vent frustration. Finally - it is not the manager's fault. Capello has imposed discipline on one of the most luxuriant and useless teams in World Cup 2006: that's his USP. The worst thing for England now would be if, inspired by commentators and tabloids, we all decided it was Fabio's fault for failing to let Our Boys play their usual, uproarious, chaotic game of "punt it to Crouchy and run". The World Cup 2010 will be won by the most disciplined, skilled, coached and tactically adaptable team. Lads: it probably is not you but don't fall out with the one man who could make it happen. There is no English equivalent to Gillo Pontecorvo's Battle of Algiers. But if I was choosing a compulsory film to show tonight in the England Camp it would be Richard Attenborough's A Bridge too Far. It shows how to retain dignity in defeat. And at the same time what it means to be English. It's become the signature event of a World Cup game: the ref spots some kid with attitude displaying that fatal combination of high studs and backchat and yellow cards him in the first five minutes. Signal: next time you're off and a warning to the rest. In such cases it is seldom just the technical offence that produces the card but the attitude - and indeed reputation - of the player. It is seldom fair in terms of jurisprudence but it works: there have been no brawls, no triple sending-off games, the football flows and is fair. Now consider the regulation of banking. Every so often an e-mail arrives from the FSA announcing that Mr Acme of Acme Mortgage Brokers has been struck off and fined for enabling the residents of Acmetown - not unsurprisingly given Mr Acme's previous convictions - to gain million pound mortgages on homes that turn out to be lock-up garages. For some reason this form of refereeing is not quite so effective. And now the FSA itself is to be abolished. The problems with UK financial regulation go beyond structure. Last night's big structural re-hash addresses one problem: the lack of clear accountability for macro-prudential regulation. The Bank was targeting interest rates, the government targeting growth and tax revenues, the FSA - well, it was belatedly targeting Mr Acme and his ilk but somehow missing the fact that major banks were adopting tactics that - to switch back to the football metaphor - were certain to get the club relegated and bankrupted at the same time. The advantage of swift, pre-emptive, exemplary and above all public regulatory action is well known to judges, policemen and tax collectors. The UK's tax system works superbly, despite its reliance on self-certification, because the penalities and possibility of detection are so great. Even if you've done nothing deliberately wrong, once you attract the attention of the ref you are going to get carded. Yet the culture of financial regulation is secrecy. Because the first line of regulation is carried out by officers employed by the banks themselves - as the Paul Moore/HBOS scandal showed - there is a conflict of interest at the very root of the system. Then, once the regulator is alerted to a potential problem, it's all sorted out in the back channels. But these back channels do not work. "The supervisory team did not adequately identify and pursue risks arising in the firm as a whole and in relation to its business model and control framework. Our findings also show a level of engagement and oversight by supervisory line management below the standard we would expect for a high impact firm." Specifically they decided not to issue Northern Rock with a risk mitigation programme; to lengthen the time between inspections to the longest allowed by regulations (36 months) and to rely on private meetings with the Northern Rock management. These, it turned out, had very rarely taken place and crucially nobody had spotted the risks that were to take the bank to collapse. Although the Northern Rock example is extreme, it highlights the extreme risks of doing everything in a gentlemanly manner. "Regulatory capture" can occur if there is a revolving door between banks and regulators and if the two sets of human beings essentially share the same culture; and if nobody outside the charmed circle realises how the regulation is taking place. Compare this again to football. The ref is hated by everybody: he does not go for a drink with the lads afterwards. He is not usually somebody who has recently played centre forward for Inter Milan. The refs develop their own subculture. They are booed and cheered for every decision - and their behaviour is analysed publicly post-match. In cases of "regulatory capture" it is often where a ref is overwhelmed by the crowd (as has been known to happen at Old Trafford) or tricked by clever diving tactics (which has been known to happen at Stamford Bridge) - but it is almost always obvious. One problem that will remain once the Bank of England takes over the FSA is the level of public scrutiny possible. It's not just that what is secret remains secret, but that what is public is not really open to question. Mervyn King does not do "interviews" in the sense of being interrogated live on TV - whereas Adair Turner would do one at strategic moments. Likewise the Bank of England does not go around commenting or briefing journalists much - and it is virtually the only institution outside security and intelligence that holds press briefings where you are instructed not to mention they have happened. The Bank also revels in long periods of "purdah" during which it can not speak about the very events that it is crucially involved in. Of course refs are also subject to political pressure - like regulators are. Fifa will tell them to issue more red cards, or punish diving, or keep the flag down for offside more. But again it's nearly always public. So you can learn a lot about regulation from football referees. The pre-emptive yellow card, waved publicly is better than the red, the ugly brawl, the riot in the stands and the bankruptcy of the club. The hated, aloof ref is better than the matey one who will stand at the bar with the footballers afterwards. And if there is one thing worse than having an ex-Inter Milan player refereeing an Inter-vs-AC match, it is for the ref to believe he will one day soon be playing for Inter. And it would be good if the ref gave interviews. Oh, and you can sack a terrible ref. No UK banking regulator has yet been sacked - though some went of their own accord. OBR 2010: It's better, it's worse. Darling vindicated. Then not. UPDATE 2: Conservative advisers at the Treasury now say Budd's report over-optimistic in two regards: first that it is a central, not a worst-case projection and second in that it uses current market interest rate projections (based on expectations of a tough Osborne/Alexander budget) not those at the time of the Darling Budget. I put it to them they as clients might not be so pleased with the results (one economist is saying Alistair Darling should be "dancing a jig" after this). They said they were happy that the OBR has used central forecasting - and that it has flagged up its own necessary over-optimism. However they declined to try and calculate back how this projection would map onto the old Treasury projections. Where I think this leaves us is as follows: instead of the caution being in the growth figures, as before, any caution - and there will be caution - will be expressed through more cautious action: therefore there is an implied rationale for greater cuts than outlined in Budget 2010. Incidentally the Treasury has now revealed the scale of the departmental spending cuts implied in Darling's last budget: £44bn. These are the cuts that will form the baseline to next Tuesday's emergency budget - which will no doubt tighten them. UPDATE: Budd confirms that, according to his forecast, Alistair Darling's 2010 Budget would have "eliminated the bulk of the structural deficit by 2015" - which is George Osborne's aim. There is only a 0.3% of GDP difference (maybe 5bn) between Darling's structural deficit forecast and Budd's. This means there is no prima-facie ammo in the Budd Report for a significant tightening in order to eliminate "the bulk of the structural deficit". EARLIER: OK here's the headlines out of the Office of Budget Responsibility's new forecast for the UK government finances: we're going to have to borrow less than expected. Yes less. 10 billion less last year, eight billion this year, four billion next and a total of 32 billion less than originally feared over the next five years. That's the good news. The bad news is that the so-called structural deficit - that part of government borrowing that does not go away when the recession does - is larger than Alistair Darling told us. The new OBR has - not very helpfully - introduced a new way of forecasting, which takes the central, rather than the most cautious, assumptions about growth. This "makes comparison with the March  budget difficult" - and the new assumptions are not audited by the ONS. The OBR has revised down the Treasury's growth forecast. The central projection is for growth at 1.3% this year, 2.6% in 2011 and 2.8% for the two years after that. This compares to 3.25% (2011) and 3.5% (2012) in Alistair Darling's budget; and similar projections byt the Bank of England issued a month ago. In addition the OBR has revised past growth down by around a percentage point. There are a lot of new assumptions here, about world growth - employment rising by the end of this year. So more to come. But that's the first take at 1000 hrs. So much has been said about the England performance on Saturday night: the Sunday newspapers have said the bleedin' obvious and then said it again on the inside pages; Marina Hyde - the world's greatest female football pundit - has laid it on thick with sarcasm. Time to move on and examine the management challenge. 2. Capello's bad "Plan A" decisions were mainly in the selections. a) Heskey-Rooney did not work. Heskey fed others, not Rooney. b) Ledley King was not fit and then tried to limp along for the whole first half with a groin strain. c) Milner was not fit and looked dangerously outpaced until taken off. d) By playing two unfit players in these roles Cappello left the defence exposed. e) Robert Green looked ill at ease in the tunnel and then we know what happened after that. f) It appears that Capello decided to announce the team sheet late to the players. This did not work. 3. Faced with poor individual performances Capello quickly remedied his Plan A mistakes. But he should have probably removed Ledley King much earlier - in this World Cup minutes dragging by while you execute what's obvious matter. This is the Fergie disease also and may just be a disease of old managers, for whom minutes have ceased to matter in the great scheme of things. 4. What to do now? England need to beat Algeria and Slovenia in high-scoring games so they do not have to face Germany in the first knock-out round. These two games - which should be easy wins - also provide the platform to "norm" the team. Team building, according to management theory, goes through cycles of "forming-norming-storming-performing". To see a team performing, just watch the re-runs of Germany versus Australia. England are clearly at the stage between forming and norming but that's not a tragedy if Capello can get things right in the next 10 days. Incidentally if you are wondering why a team that has played a year's worth of qualifying matches is still "forming" remember the old business management adage: when a new member joins a team, it's a new team. 5. It's no longer an issue of individual skill and performance. England are never going to play fancy, beautiful football like Argentina, or drilled precision-tool stuff like Germany. They are always going to play like England; on the heart-stopping edge between incompetence and brilliance. The midfield may have malfunctioned at times on Saturday but there was no longer the feeling of absolute panic and aimlessness that beset many of the same players in 2006. 6. So it's an issue of formation and finishing. A lot of the pundits are pushing for England to play 4-4-1-1 with Gerrard in the hole and Rooney up front. There are two choices for Capello: to save this for the time when they really need it - ie against world class oppostion - or go for it now. In favour of keeping 4-4-2: England need to use the next two matches to make the default formation work. It worked decently with Wright-Phillips on left wing and would work also with Joe Cole in a wing role. However Lennon kept failing to go for the byline and cut inside - (fear of failure?). 7. Capello has to make a decision: where to put managerial focus and energy for the next four days? Option One: put it into trying to make the current system work properly versus Algeria. I said in Part I that the 4-4-2 English game has problems with strikers drifting through the back four: it should not have problems with strikers drifting between the back four and the midfield - but it did. So a clear, achievable goal would be to stop that happening. He needs to accept, inwardly, that he made hope-over-reason decisions in playing King and Milner, and probably in bringing Carragher on instead of Dawson. 8. Option Two would be: accept the 4-4-2 is not going to work against an serious opposition in this tournament (Argentina and Germany already exhibiting the wow-factor) and use the next two games to try and get a 4-4-1-1 system up and running, possibly at the cost of a low-scoring victory in each match. 9. None of this is ideal, but his options are getting closed down by injury and player age already. This is the key management challenge and it needs to be addressed within 48 hours. 10. Another key part of the task is to instil elan and belief. What there was clearly evaporated once Green had let the goal in. Real belief and relaxation and focus are what England always lack. Why? Coming up Next: the Office of Budget Responsibility Report, 0930 Monday. Association Football, as all social psychologists know, plays two key roles in British society. First, it allows men to use emotional language to each other and to go so far as touching each other in public. Second it allows business consultants to utilise football as an illustrative metaphor for the wider problems of business management. In this second regard, Idle Scrawl will not disappoint. Following the blog that rocked the England dressing room in 2006, I will be regularly writing on the issue of football management strategy, tactics, personnel management etc during this World Cup, as a welcome break from fiscal catastrophe. Here's the basic theme. With the rise of technology, and the never-ending stream of megabucks into football, the game at club level is at an unprecedented level of managerial organisation. There are "labs" to look after the players' minds and bodies; systematic coaching of functions - that is defence, offence, goalkeeping, set-pieces - approaching NFL levels of sophistication; there is systematic intelligence using videos and computer generated match analysis; and there are internationally standardised coaching processes. And my hunch is in this World Cup, the best coached and organised team will win. So what are the coaching challenges? The first problem for World Cup managers is they are confined to what the national gene pool has thrown up: they can't just build a system and buy in players to fill it. Cappello is a famous tweaker of teams and systems, once commenting "every time you make wine the grapes are different"; so he's used to the challenge. Next big question: what formation naturally fits the skills available? This may not be the right formation to take on the playing styles of your opponents and leads, in all World Cup campaigns by England - and most memorably in the movie "Mike Bassett, England Manager" - to constant tinkering with the formation. With all previous England campaigns the problem has been their inability to make anything other than 4-4-2 really work, because most English players play in the English premiership where, though 4-4-2 is not ubiquitous, it is the "culture". The third challenge is posed by the playing environment. Most World Cups are played in hot weather, disrupting the fast playing style of teams like England, while other northern hemisphere styles, such as Italy and Germany, seemed to adapt better to the climate. This time it will be different: it is winter in South Africa and there is also altitude. The challenge will be to see if the north-hemisphere clubs can use the "shock" of being able to play at consistent speed to wrong-foot the hot country teams. Now the specifics. England's huge problem has been failure to create a confident, coherent, ball-distributing midfield. This was amplified in previous tournaments by the clear psychological "fear of failure" syndrome, where players were playing with an eye to what they would write in their celebrity newspaper column after getting knocked out. Many soccer pundits have urged Cappello to abandon 4-4-2 in favour of 4-4-1-1, in which the midfield 4 are joined by a fifth player whose job it is to play in front of them. This has two advantages: it avoids the midfield 4 having to constantly use all their energy pressuring the ball: the classic 4-4-2 England tactic is to have the wing players in midfield surge forward and then cross, or nip inside. But it leaves the two central midfielders as essentially defenders - whereas England's two central midfielders are both natural attackers: Lampard and Gerrard. Against Japan in Graz, Cappello briefly tried out 4-4-1-1, with Joe Cole behind Rooney. Suddenly England were buzzing. Then he changed the formation back to 4-4-2. Since the USA are the key threat in England's group, and since England really do need to win that group to avoid meeting somebody like Germany in the first round of playoffs, Cappello's tactical decision on how to start versus the USA will be crucial. I think football coaching has developed so far, so fast, that the winners of the World Cup are not necessarily going to be the most skilled or even the ones who can play like Brazil or Barca. They are going to be the most drilled team; the team that can make tactical switches - of formation, or priority, or marking systems - in a very co-ordinated and intelligent way; or adapt one core formation to a variety of challenges. In addition, they are going to be the team where morale and temper can remain under control; or suppressed by an over-riding nationalism that holds things together. For all these reasons my "dark horse" tips - on the eve of the tournament - are the USA and Serbia. The fiscal dance steps between now and 22 June are choreographed with a precision worthy of Balanchine, starting with the David Cameron speech that has just concluded. Two years ago a senior conservative businessman told me George Osborne planned to institute an emergency review of the public finances on coming to power; that it would probably find growth was not as predicted, and other unexpected line-items not quite right; and that therefore cuts would have to be bigger than expected. And so it will now come to pass. However, in the intervening period two events have taken place that complicate matters for Mr Osborne. First, the Greek fiscal crisis. This began with an incoming government, er, discovering that its predecessors had cooked the books; that the budget deficit would be bigger than expected and thus cuts needed to be much harsher. Not un-noticed by the rest of the world, this then resulted in a debt-downgrade, followed by an emergency budget which nobody liked, and then another series of debt downgrades. In the post-Greek situation any claim by a finance minister that "the books have been previously cooked and the deficit is worse than we thought" is in danger of rattling the markets. I interpret the G20's strong signal for Britain to slash its deficit, together with other high deficit countries, as an attempt to bolster market confidence during the delicate unpicking of the Alistair Darling deficit reduction plan that will now take place. Second, the need to govern in coalition with the Libdems. I understand that, during the coalition negotiations during the weekend after the election, a key issue for the Libdems was to have both a voice inside HM Treasury and "eyes and ears". Any process of discovering Budget 2010 to be, as George Osborne declared it in advance of the election "a work of fiction", had to be itself subject to scrutiny. On top of that, any further tightening on top of the Conservatives' proposed envelope of deficit reduction had to be done "non-ideologically". That is the narrative behind Nick Clegg's intervention on Sunday - that cuts will not be done in a "Thatcherite" way. Mr Cameron's speech on Monday morning outlined the scale of the cuts they expect to impose: it will be used as an opportunity to completely re-think what services the public sector delivers. On Tuesday, Mr Osborne will outline the mechanism for doing what Alistair Darling failed to do - a three-year spending review with departments finally getting their spending limits set: ie, turning the medium-term public spending projections into actual budget limits for minsters. There will be "consultation" but also a "star chamber" - ie repression. a) Growth. The Treasury's growth projection of 3.25% was seen as high by independent forecasters. However, one caveat: it is accepted by the Bank of England, on the basis that the £200bn of quantitative easing money has largely yet to filter through into demand. b) The "housing and finance" component of deficit reduction: when it calculated how it would reduce the deficit by 90bn, the Labour-led Treasury assumed around 17bn would be regained through a revival of tax receipts from home sales and the finance industry. This is on top of any natural effects of returning growth. Many economists were sceptical about this. c) Efficiency savings: despite the promise of efficiency savings becoming the AK-47 of the guerrilla warfare between parties before the election - ie the weapon of choice - there is no proof that efficiency savings ever work. The last attempt to measure Labour's efficiency savings found at least half had not been measurably delivered. If Budd's boffins find Labour's in-progress efficiency programme has not delivered they will add this to the pile of problems. What we've learned form the Greek budget process is that governments start out with Plan A; then an emergency budget comes along in which they protect "the weakest" - in the Greek and Irish cases hammering public sector workers but maintaining services where possible. Finally, in the face of adverse market reaction, they pass budgets that actually slash services they said they would protect. If that doesn't work they lose sovereignty over their own budget to other countries or the IMF. Mr Cameron is clearly trying to avoid this happening - but as he said in his speech, Greece is the warning. The point about tightening the budget by close to 90bn a year is that it is certainly do-able. The big ideological discussion is whether you use tax or spending: interestingly during the stimulus phase, the spend/tax mixture was 2:1 globally. Britain's new government is pledged to achieve "the majority" of tightening through cuts - but this still leaves a lot of room for tax rises. There are two questions though: first, is it doable without causing a double-dip recession? Since the Treasury under Mr Darling always factored its own spending plans into the growth projections, we should expect the emergency budget to come clean on this. Second, does the "unexpected" size and nature of the new deficit projection cause one or both parties to say they can no longer stand by their manifesto commitments to ring-fence aspects of departmental spending (hospitals, schools and aid)? If it comes to pass that, with heavy heart, they now have to slash the NHS budget, cancel Trident etc - it will be interesting to see if that can be choreographed.